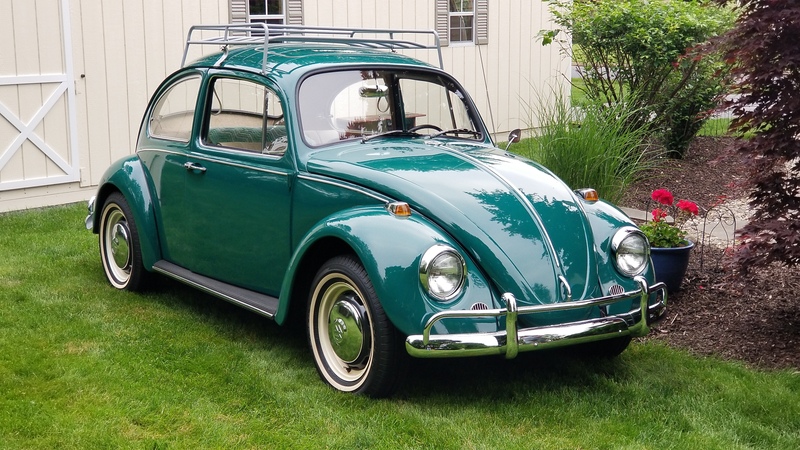 The story of Lela’s 1967 L518 Java Green Beetle begins over 40 years ago. 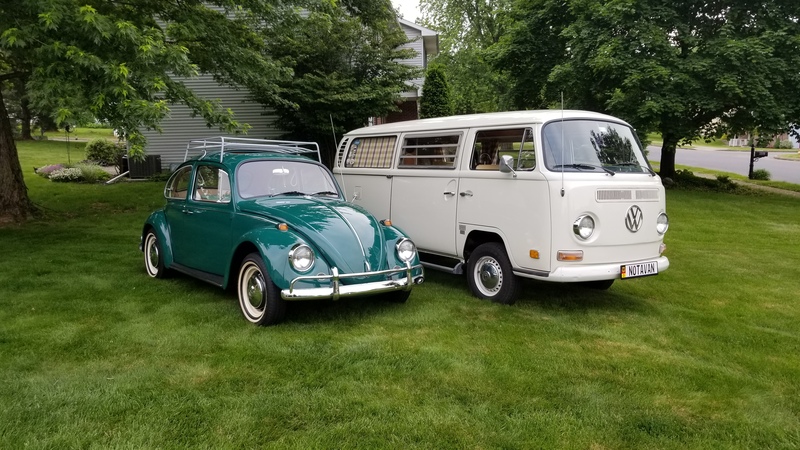 For years, my wife has endured stories of my family’s collection of VWs, including my first car, a 1970 Sumatra Green Deluxe Transporter passed down through the family. I rebuilt the engine in the basement using “The Idiot Book”. I learned to “be one” with my VW like John Muir says… she’s heard them all. The last story about that Bus involved a NYC taxi cab, which lead to stories about my 2nd car, a ‘76 Senegal Red Transporter that I sold for $500 out of college because “who knew what they would be worth”, etc. Lots of stories and she patiently listened to me tell them. 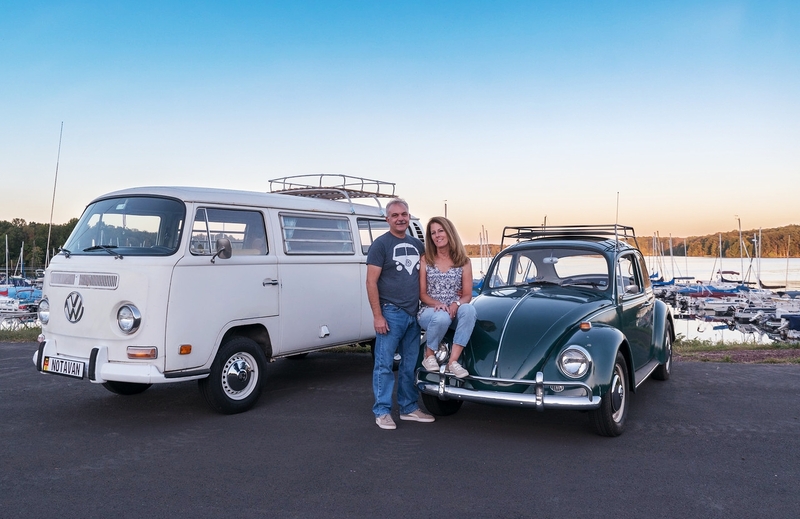 Well, it turns out that Lela has her own stories of vintage VWs, which I found out last year when she got behind the wheel of my recently purchased ‘71 Westy and drove it like a champ! Not a stumble or hiccup! It turns out that, even though she owned many classic muscle cars back in her day (Lela can identify the year and model Classic Mustangs in her sleep), Lela learned to drive stick shift in her mom’s late ‘60s/ early ‘70s Karmann Ghia and Beetle! 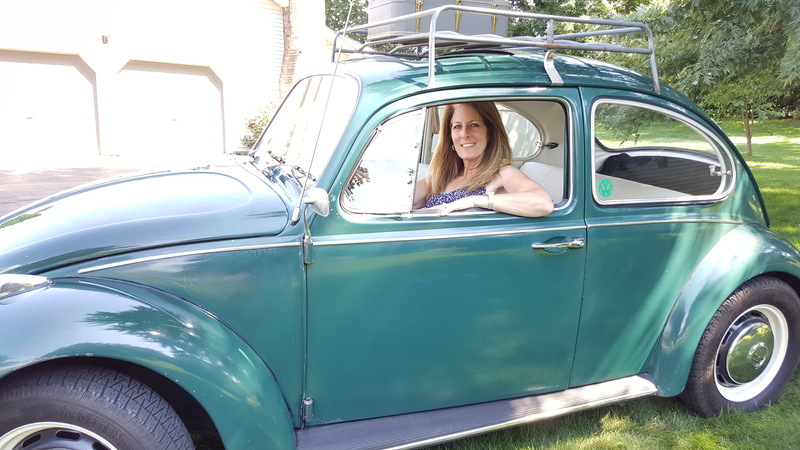 Now that we had two vintage VW drivers in the family, we decided that we would try to find a Beetle for Lela so that we could enjoy the air-cooled lifestyle together. So Lela began to research what year and features she was looking for in her new Beetle. As we took the Bus to more and more shows, we began to see what the different years of Beetles offered. 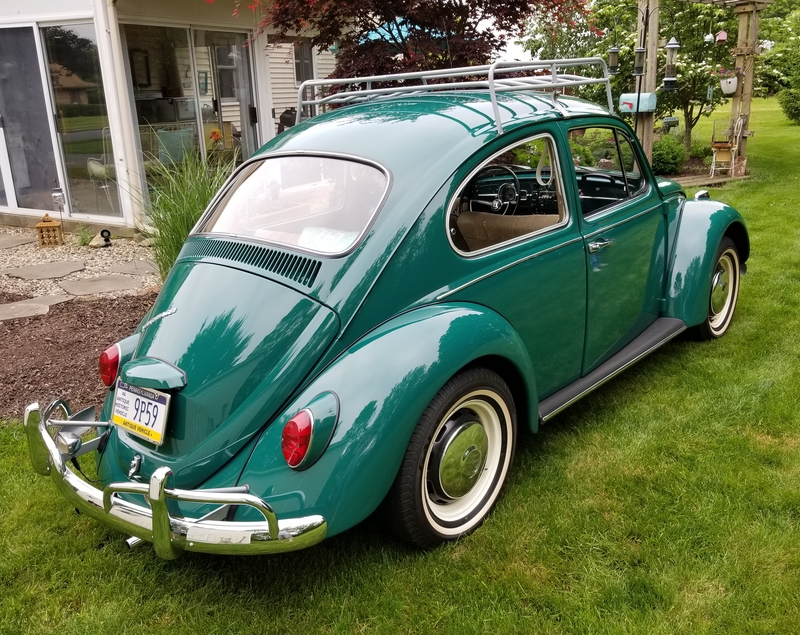 Going to vintage VW shows and gatherings is a great way to see what you are looking for and NOT looking for in a car: stock survivor, stock restored, resto mod, slammed–even filthy buggers! We saw many different Beetles and spoke with many different people at the shows. Lela decided that she wanted a Beetle with an all metal dash, pop-out windows and a sunroof rather than ragtop. 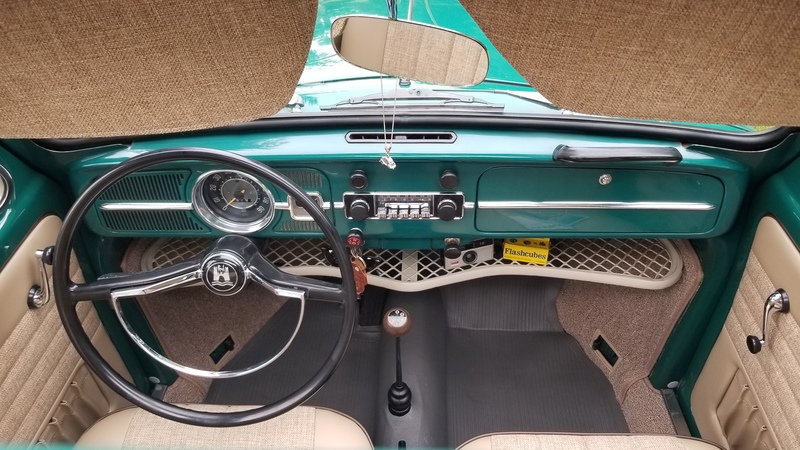 A good friend of ours, Gregg, told Lela to look for a ‘67 — last year of the all metal dash, first year of 12 volt system and a very collectible year due to its one-year-only parts. 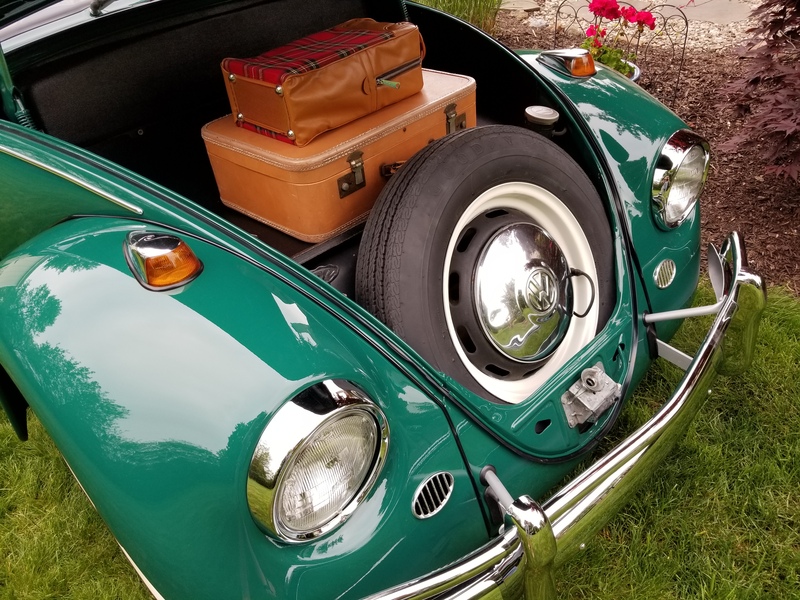 Our VW friends, Bill and June, happen to have two of those: a Sedan, owned by Bill, from new, and also a Convertible, named “June’s Bug”. Beautiful cars! Lela was looking for a driver – a car she could enjoy regularly without worrying about a nick here or chip there, with sunroof and pop-outs. Mechanically and cosmetically good, not a show car, but if we wanted to, we could do a restoration. Easy! One thing that Eric tells readers of the site is not to jump at the first car you see. I cannot stress enough what a great piece of advice this is. 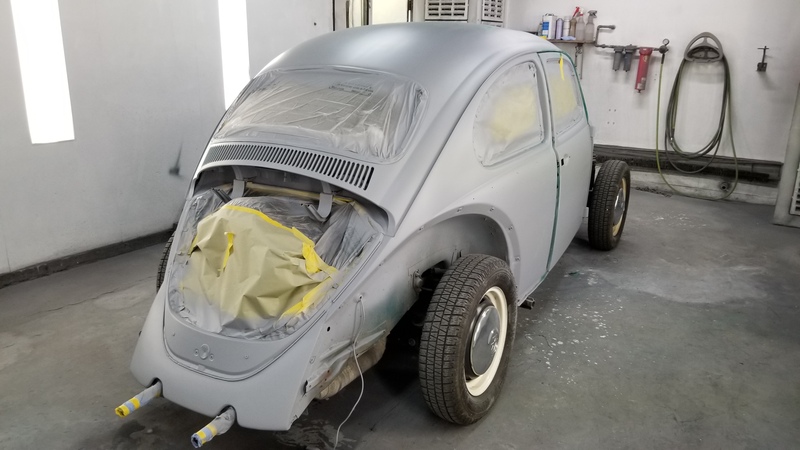 One of the candidates Lela found was a reasonably priced L282 Lotus White Beetle that looked great on the surface, but after looking closer, with Eric’s help, we discovered several items that were not correct for a 1967 Beetle. 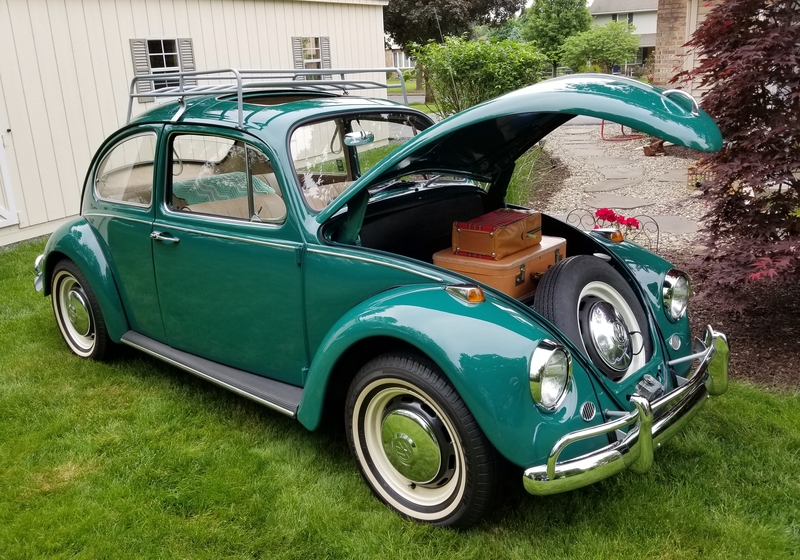 For another year this may have been OK, but given the collectability of a ‘67 beetle, Lela was looking for a “correct” car and this one wasn’t. 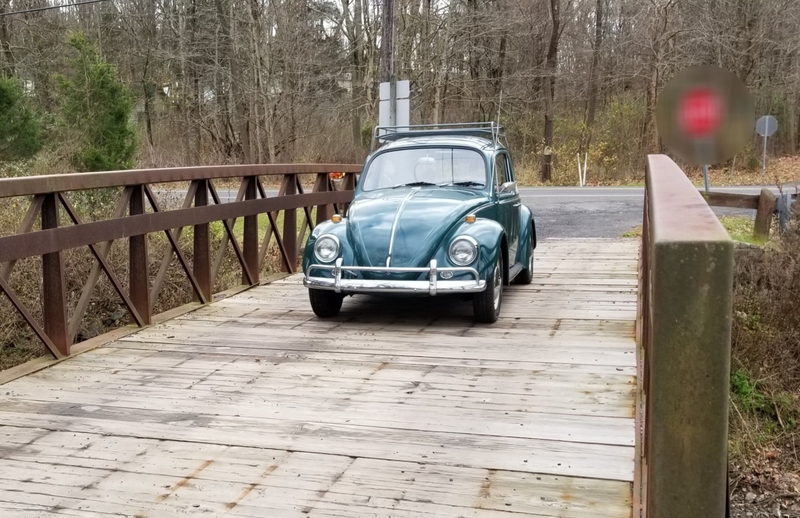 The search continued to an L633 Blue Beetle in New Hampshire that looked great but the owner had an interested party that was due to return. Sure enough, he did. A Ruby Red Sunroof with pop-outs in Maryland had an owner that wasn’t too forthcoming. Several other cars came and went and, just as things looked grim, Lela found Chad with his L518 Java Green Beetle with sunroof, and factory pop-outs! Less than two hours away! 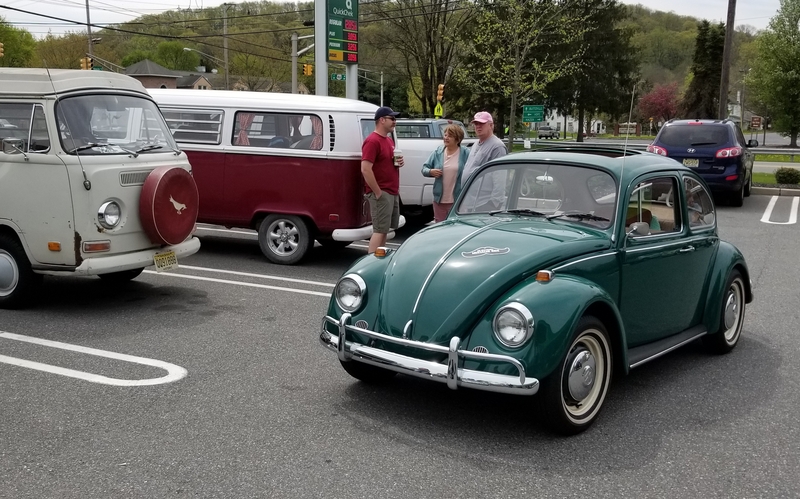 We drove down to South Jersey within hours of his posting on Craigslist and found an incredibly enthusiastic VW guy who, it turns out, is a corporate mechanic for a major car manufacturer – a great mechanic. This car had been his personal project for several years and we had the sense that he was OK if it didn’t sell. He was very attached to it. Each part we looked at was correct – matching serial numbers on body and chassis AND a correct engine serial number as well. A look underneath showed us new pans, rebuilt beam, suspension and transaxle- what a great surprise! The only non-original features were upgraded front disc brakes and an alternator instead of generator. The brakes are an upgrade which Lela doesn’t mind–for the sake of safety. The alternator we can live with. An honest, enthusiastic and knowledgeable seller is extremely important in my opinion. Chad was able to give details about his work on pans, transaxle, engine and electrical. He had intimate knowledge of the whole car and also gave us pictures of the complete process of his restoration. The “Birth Certificate” confirmed that the pop-out windows were installed at the factory. 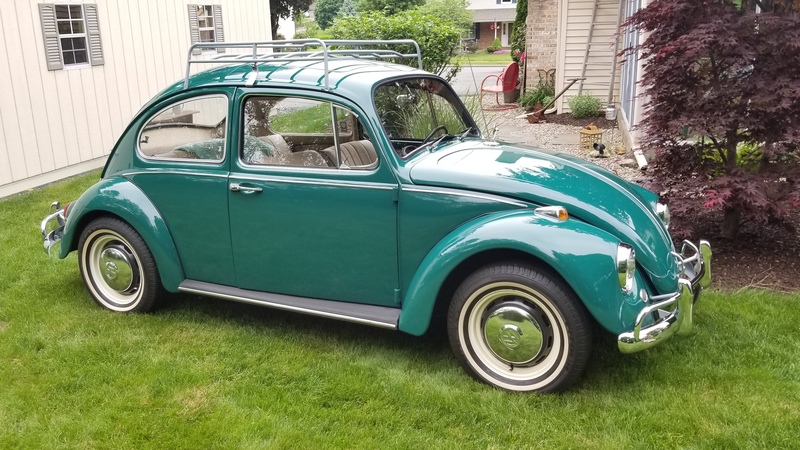 At some point, the Beetle had been repainted an incorrect color on the exterior but the interior was correct and still in great shape. Upholstery was good as well. 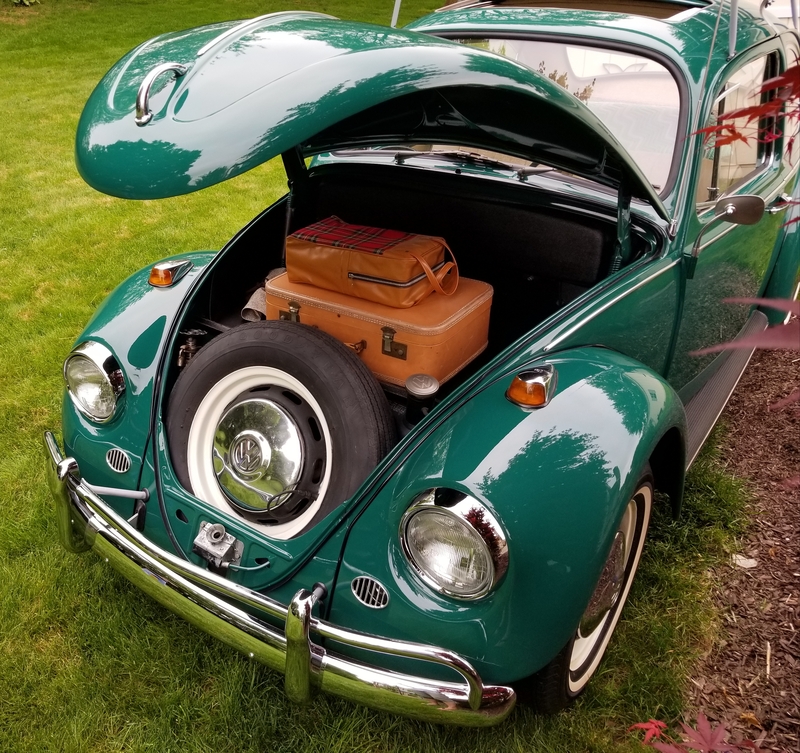 We paid more than we intended to spend, but this Beetle was in top mechanical condition and such a knowledgeable and particular seller made it worth every penny. 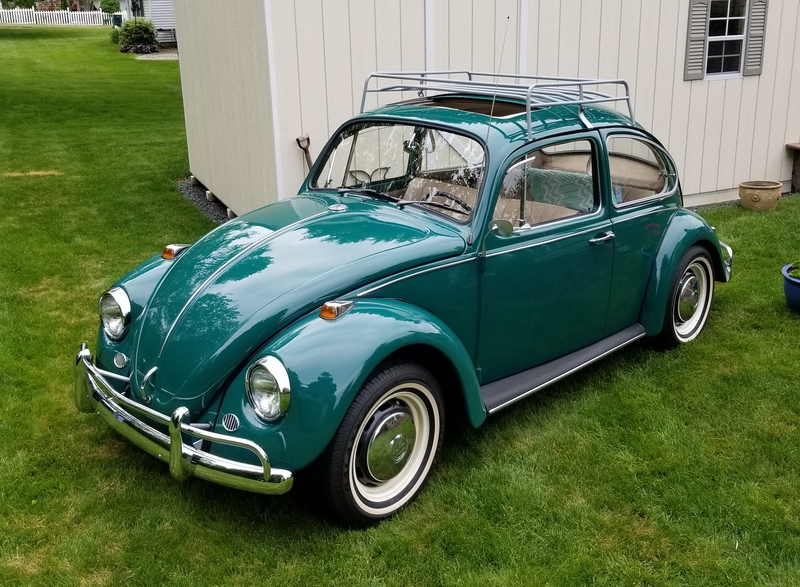 As is the case with many sellers, Chad had accumulated many parts for a ‘67 Beetle, including correct German fenders, hood and new decklid. We bought those, as well as defrost tube splitters and various other ’67-only pieces. Now Lela had her Beetle and it was a beautiful car to drive! The more she drove it and the more shows we went to, the more we realized how special it was. 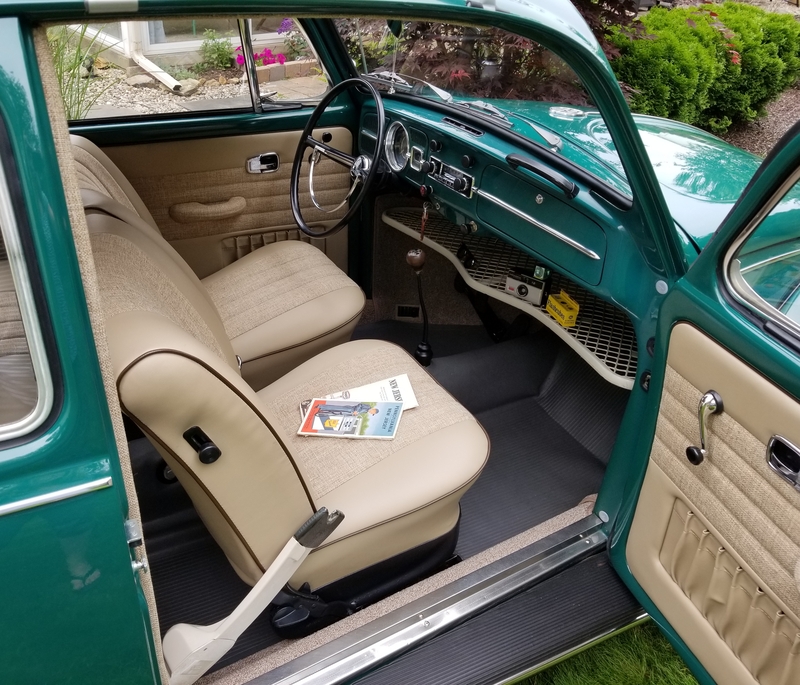 The Java Green color is really beautiful and the color we saw on the interior of the car was so much nicer than the exterior color. Depending on lighting, it can glow bright green or it can take on a deeper, darker color as well. We decided to have the exterior repainted the correct L518 Java Green at a local shop known for its VW work. 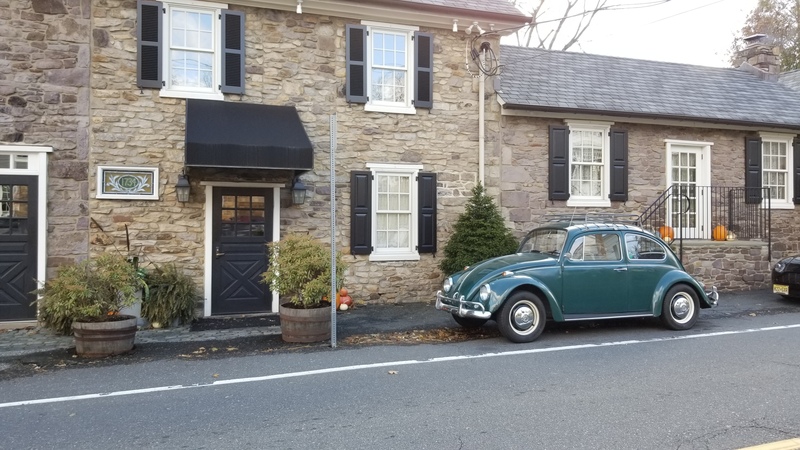 Purely by coincidence, she went into the spa for a makeover on the Beetle’s exact 51st birthday- December 29th, 2018! The German VW parts we bought from Chad were actually in better shape than the parts that were on the car, so the work went very quickly. Since the interior paint was original and in good shape, Lela decided not to repaint the interior. This gives the car a lot of character, with every smudge and nick making us wonder how it happened and when. Still, we wondered whether we might have the interior painted one day to match the outside. 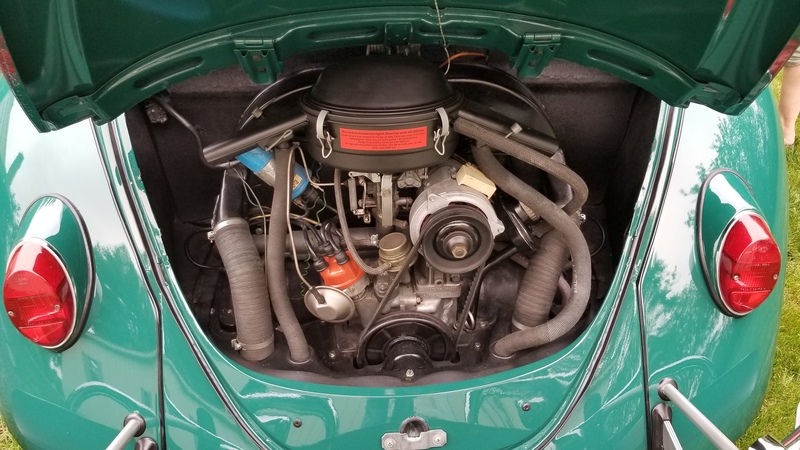 On 1967beetle.com, there is a post of Chris Vallone’s L518 Java Green Beetle. Lela loved the SewFine interior he put into that car, so we called Carol at SewFine. Carol made a list of pieces we would need, complete with cloth headliner. 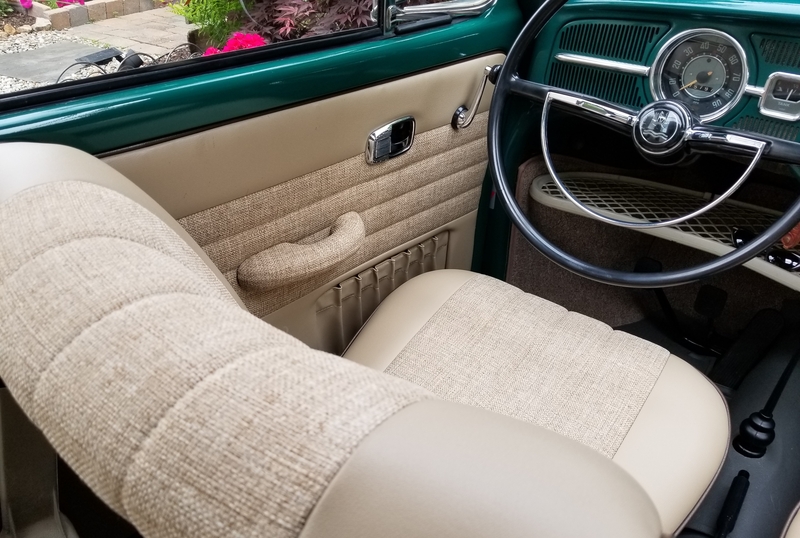 Since we drive the car quite a bit and the temperature can get a little warm in the car, the cloth inlay on the seats is more comfortable and cooler than the vinyl seats. Lela decided to keep the grey floor mat rather than carpeting, so she left the carpet pieces off the order. 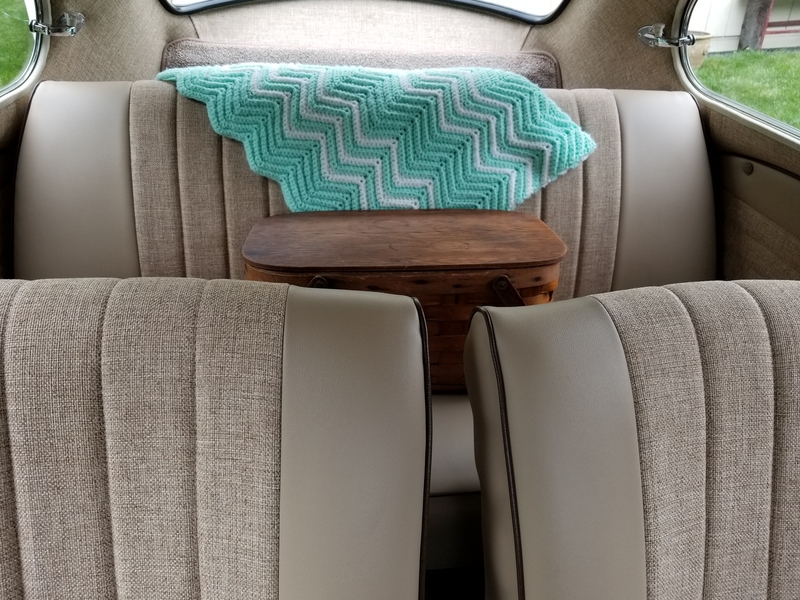 Finding an upholstery guy who does Beetles is not easy, but checking the Samba Vendor listings, she happened to find a guy less than an hour away who had a decent reputation and an excellent price. There was an issue fitting the side panels in the rear so we do have new pieces from SewFine to put on. 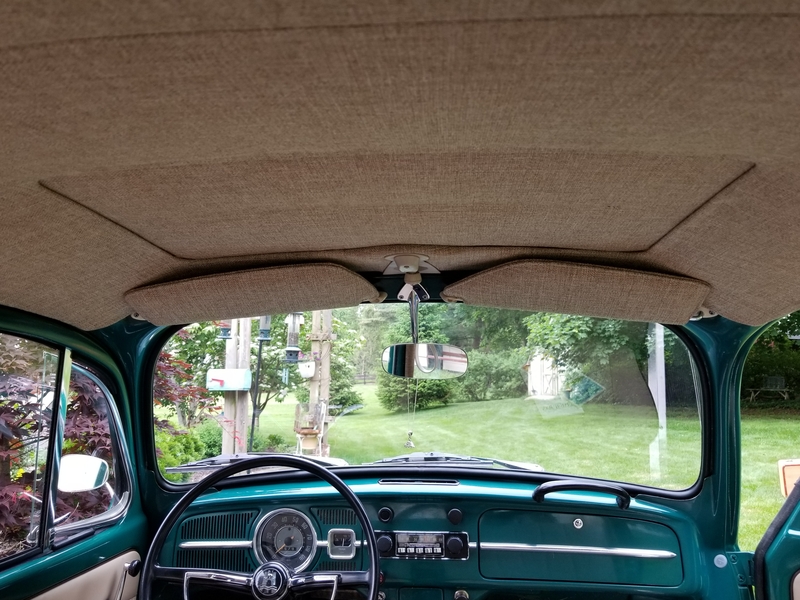 But the cloth headliner around the sunroof came out great! 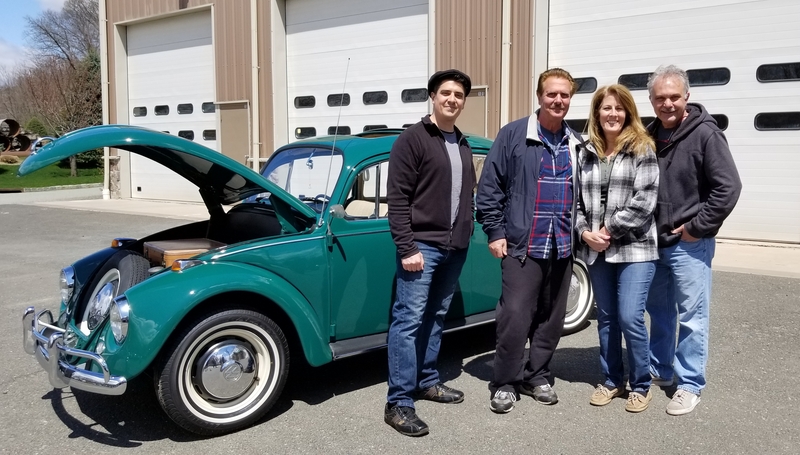 Speaking of Chris Vallone, we took the Beetle to his first open house this year and got great feedback from him and his father – super nice people to talk to. 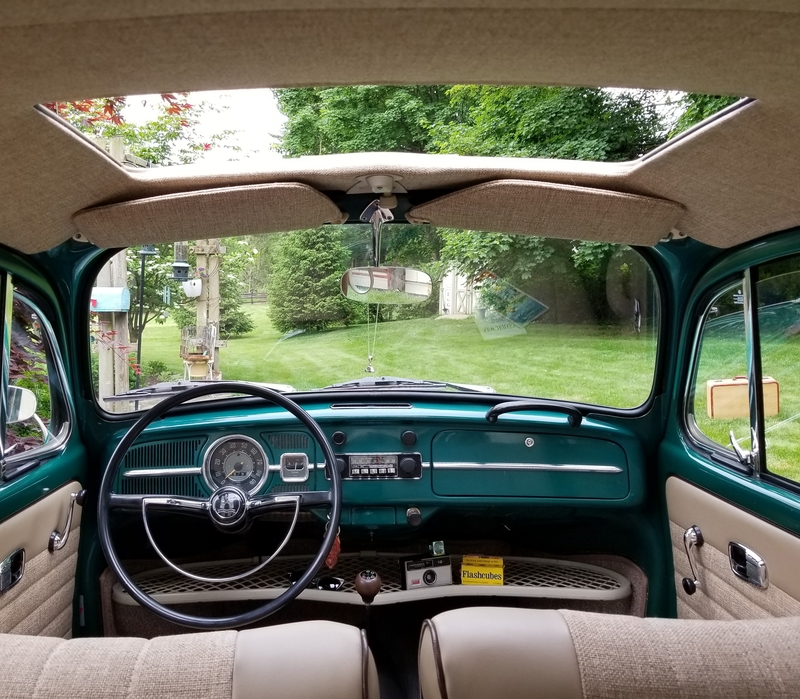 Chris liked the interior (it was his choice after all) and it turned out that he had a Sunroof car in the shop that he was restoring, but he wasn’t sure whether the thicker cloth headliner would give enough clearance for the sunroof to retract without pulling on the fabric, or not. Lela’s Beetle gave him the answer he was hoping for. 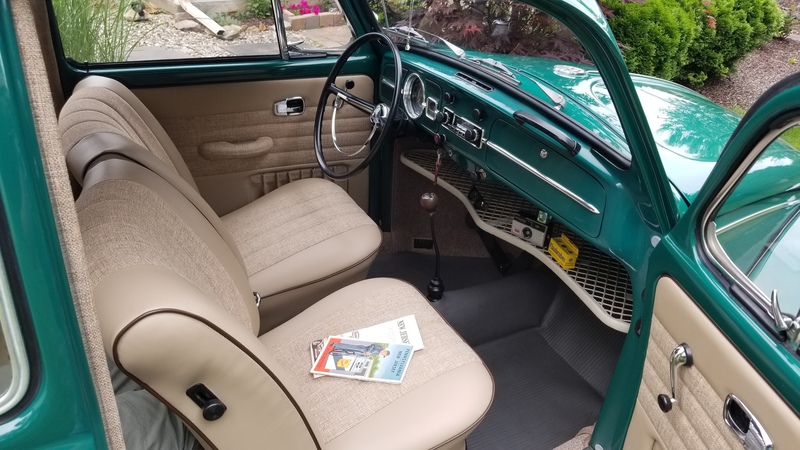 As I mentioned before, one conversation can set you off in a certain direction, so when Chris heard that only the exterior had been repainted and that the dash was original, he suggested that we not touch the dash – it looks great the way it is! We’ve really enjoyed working together on this project and I am very proud of my wife for not only researching, but also finding the exact car she was looking for. 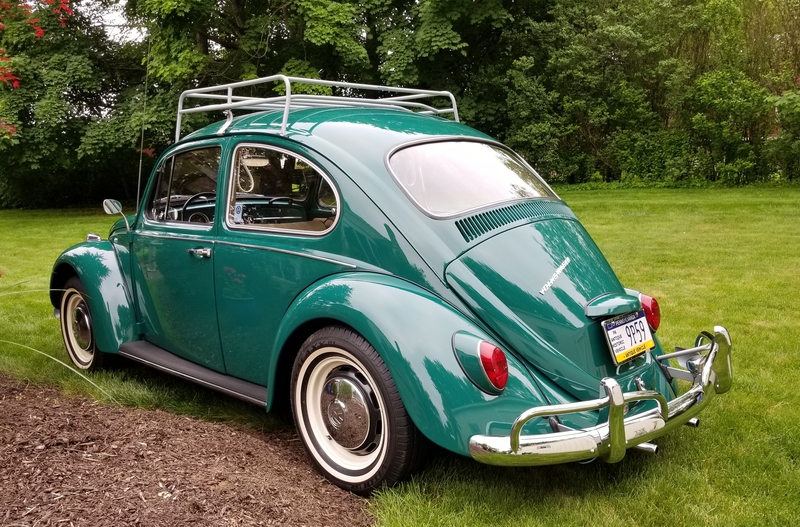 The whole Vintage VW Experience can be extremely positive and enjoyable with the right information on hand and we learned so much about this special year on 1967beetle.com. Thank you to Eric for his help by answering emails quickly and taking the time to offer advice. 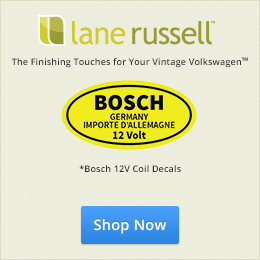 And to Lane Russell for a few hard-to-find parts we needed along the way. The “Beetle Stories” we’ve read are inspiring and offer a lot of great information. 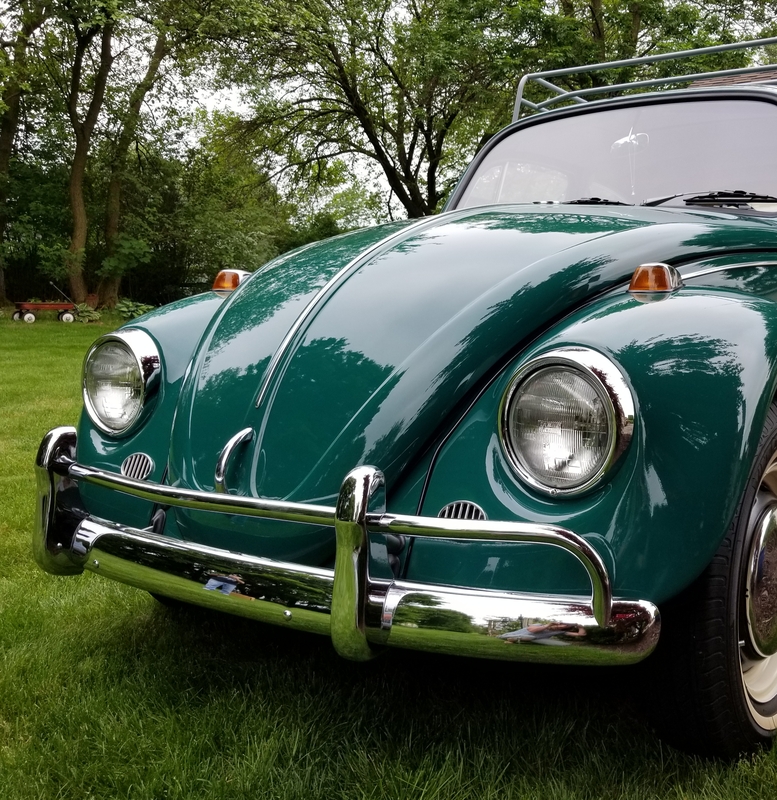 We hope that our story will help other enthusiasts who may be looking for their own beautiful 1967 beetle. Fantastic! L518 Java Green has always been a fav color. Great story. Beautiful car. Enjoy, enjoy, enjoy. I like the bus too ! Mike! I think it’s time for you to own another ’67 Beetle. Don’t you agree? 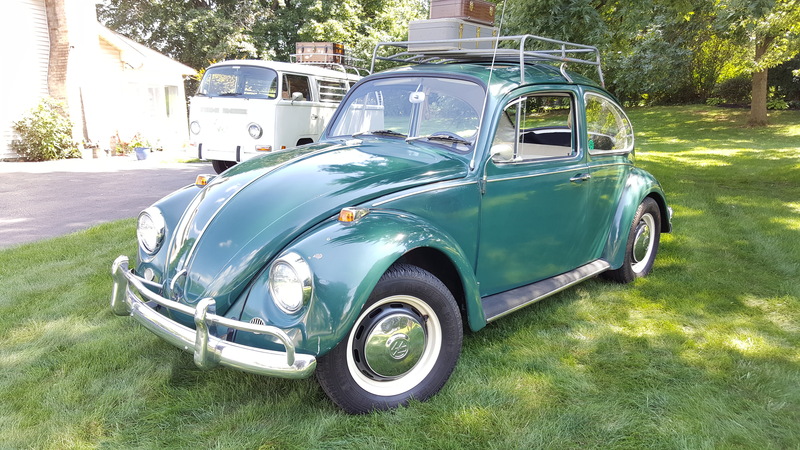 What a gorgeous emerald of a 67 beetle that is! Great options on it! Dark green is a classic 60s color. And it is easy to see why! Thanks for sharing the story! Happy (67) bugging! Nice car! My ’67 sunroof was built on December 22nd. I wonder how many numbers apart our VIN’s are. You can message me at Vintagevolkswagensales on Facebook for privacy. Thank you for the kind comments! This beetle has really been a nice project for us and this site was really a blessing. We were planning on working on the car for up to 2 years to get to this point (we bought the car in Aug ’17) but by being patient on the front end as Eric said, we saved a lot of time and money on the back end. The previous owner Chad is awesome- we are very close friends with him today. There’s a picture of Lela and Chad above- Chad has the purple VW t-shirt on.The heavy lifting he did with the mechanicals allowed us to concentrate on the cosmetics and get the car done way ahead of schedule and under budget. 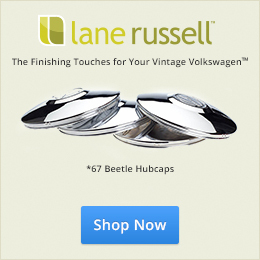 Thanks again fir featuring Lelas’s Beetle on 1967beetle.com! The pictures above where the beetle has black wall tires is before the “beauty spa”, as Lela put it. The color is just slightly deeper than Java green.. But you really see the Java Green pop in the pictures with the white wall tires! Robby and Kyle at Alpha Auto Body in Alpha NJ are real professionals when it comes to VWs. Robby asked what king of job we want, show quality or driver quality. This is his driver quality paint work! I’ve had the privilege to see this gem in person. You just don’t see many this pure. Rock on Lela! Beautiful 67! Love the interior. Lela great job in picking this gem out. I’m still smiling with you over your amazing conquest. You look too young in your fotos to be SO SMART!!! You did EVERYTHING right. Just one more question: Have you christened it yet? As perfectly elegant as it is, it could be either a gentleman or a lady. I always get to name ours. AH, JAVA GREEN, my favorite color. What a beauty. Enjoy the miles you will put on it. Restored as original and NOT altered as SO many are these days. WONDERFUL!